A recent consumer survey concluded that the newly introduced Sony Xperia XZ3 sports the best display amongst its top-tier rivals. The testing was conducted by Strategy Analytics and the list of smartphones put against the Sony flagship included the Samsung Galaxy S9, Apple iPhone X, LG V30, Huawei P20, and the Xperia XZ2. 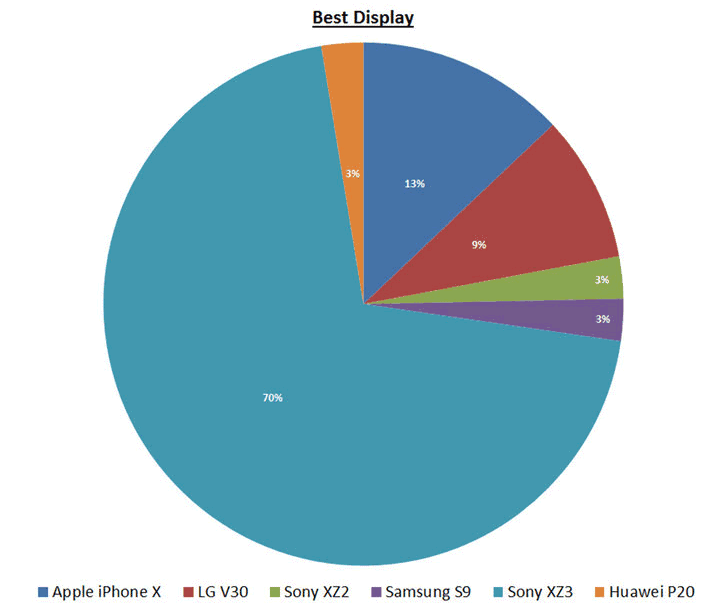 An overwhelming result followed the survey with 70 percent of the 202 participants favoring the Xperia XZ3’s OLED display while its closest opponent – the Apple iPhone X – could only gather 13 percent of the votes. Next in line was the LG V30 with 9-percent votes followed by the Samsung Galaxy S9, Sony Xperia XZ2, and the Huawei P20 collectively securing the fourth spot. The devices were disguised to avoid revealing their form factor and brand to the participants. The same set of images and videos, including Venom movie trailer on YouTube in standard definition, were simultaneously displayed on all the smartphones that had their display brightness set to maximum with auto brightness turned off and factory settings maintained. Post this testing, the consumers were asked to rate handsets under different parameters – brightness and clarity, true life colors, contrast, sharpness and definition, vibrancy, and best display overall. In all these tests, the Sony Xperia XZ3 lead with a majority share of the pie with varying percentages. The latest Samsung flagship – the Galaxy Note 9 – couldn’t be a part of this survey since it was conducted between August 21 and 23 and the Android flagship wasn’t available until then. Sony introduced the Xperia XZ3 at the ongoing IFA 2018 event a couple of days back with a slew of new additions and improvements, one of them is its display. The Japanese company made use of an HDR OLED display for its latest flagship smartphone that offers a QHD+ resolution of 2,880 x 1,440 pixels. Dynamic Vibration System has been included to provide a haptic feedback based on the audio output and a pair of front-facing stereo speakers have also been added to complement the improved display. The Xperia XZ3 is probably the first smartphone to come running Android 9 Pie out of the box, while it gets 4GB of RAM and 64GB of expandable storage, paired with an octa-core 64-bit Qualcomm Snapdragon 845 processor. You are reading an article on the Sony Xperia XZ3’s OLED Display Is The Best, Claims A Survey. All materials on the site Gadgets F, а также и статья Sony Xperia XZ3’s OLED Display Is The Best, Claims A Survey - written for the purpose of information enrichment and we are happy if you like our magazine. My first drone: where to start?